Perhaps the most valuable counsel offered by public relations professionals is this: Identifying threats to the organization, and crafting a communications strategy should a threat escalate into a crisis. At least that’s what The PRDude, and certainly many other practitioners maintain. The belief that it takes years to build a reputation, but only minutes to have it come crashing down has lots of validity, especially today — when messages can be communicated in real time. Speaking of crashing down, over the weekend a so-called “space object” — or more precisely an asteroid — seemingly fell from the sky and crashed in the Ural Mountains of Russia. 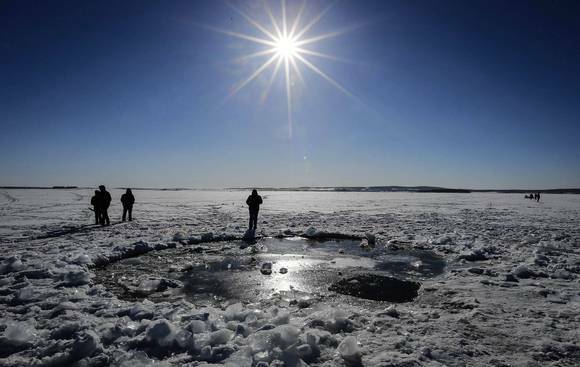 Scientists are still trying to pinpoint the exact location, but they believe it’s in Chebarkul Lake, which is 60 miles west of the city of Chelyabinsk. You’ve probably witness video footage of the damage caused by this rock from space: Tremendous shock waves that shattered windows and causing lots of injuries; fortunately, I haven’t read of any fatalities. The purported damage to property is estimated in the tens of millions. And, that was from one rock. But if that asteroid had a different trajectory, like into a populated area, the results could have been catastrophic. But somehow, someone will find a way to earn a buck from falling space rocks, as evidenced by this eBay post offering a “65.20Ct or 13.00g Russia Natrual Rock From Space Russian Sikhote Meteorite #11.” The current bid was around $20. In the past, I’ve blogged about the value of public relations in modern society, and how effective, strategic communications is the right thing for a modern society. Last fall, I shared some thoughts on Hurricane Sandy. I didn’t have much direction on how public relations could make things better following a catastrophic storm, and not so sure what public relations can do should more and larger space rocks land on our planet. An article published Saturday in the Los Angeles Times quotes Russian scientists who are lobbying for development of “an advanced space danger monitoring and warning system, and above that, a system capable of destroying such super bombs falling on us from the skies.” Given the fact man has developed nuclear weapons that can destroy life as we know it, this doesn’t appear to be too far fetched. Build greater awareness for the dangers of falling rocks from space. Garner acceptance for the fact that falling rocks from space can happen at any time. Get everyone to take action the next time we have credible evidence of falling space rocks. For the action objective above, my advice: Duck.